An affordable and capable fault tree diagram program that works on Mac and can replace Visio. It has gained international popularity for the strong ability to make fault tree diagrams and other kinds of drawings on Mac system. To benefit Mac users, Edraw has newly released a Mac version allowing users to create fault tree diagram easily on Mac OS X system. It is a simple yet powerful Visio alternative for both Windows and Mac. Compared with other Visio substitute, Edraw is more cost-effective but with more useful capacities. Edraw is a vector based diagramming software containing similar features with Visio. It contains special symbols and templates for fault tree diagrams. With its intuitive interface and full compatibility with MS Office, it has gained wide international acceptance for fault tree analysis. 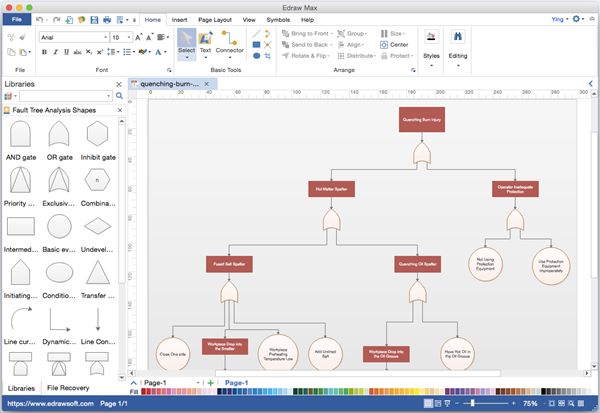 With this Visio like tool, users can develop professional fault tree diagram faster than ever. Drag-and-drop based interface to draw any kind of fault tree diagram. Include a comprehensive collection of fault tree diagram symbols, with vector format. Complete free service. More functions with a much cheaper price. Open Fault Tree Diagram drawing template. Align and distribute the symbols with quick buttons or smart guides. Connect the symbols with Connector tool. Apply fill color, quick style and theme for the whole diagram. Add title and background for your fault tree diagram. Save the diagram or export to other formats from File menu. As a full-featured Visio alternative, the software is also capable for flowchart, mind map, floor plan, BPMN, workflow diagram, fishbone diagram, timeline, network diagram, and so on.